The best marine battery chargers for 2016 all feature microchip processors, and the automation and safety features make them a great batch of chargers for any marine application. If you're in a hurry,take a quick look at the reviews of the best marine battery chargers of 2016. ​The G4 gets the best pick award due to its long list of features. We like the G4 best of all the chargers we reviewed. The Genius G4 offers four bank convenience and can diagnose and repair some battery malfunctions. It also charges Lithium Ion batteries. You may need to buy accessories depending on your needs. The Schumacher SSC- 1000A is a high quality portable charger that you can use on lots of equipment. This portable charger offers three charging settings for slow, regular and fast charges. You can only charge one battery at a time. This is a small but powerful on-board charger with great durability. The Genius GENM2 is a great on-board charger that offers full automation. If you add battery charged accessories to your boat two banks may not be enough. We like the features of the MinnKota, and the 24 volt capabilities may be just what you need. 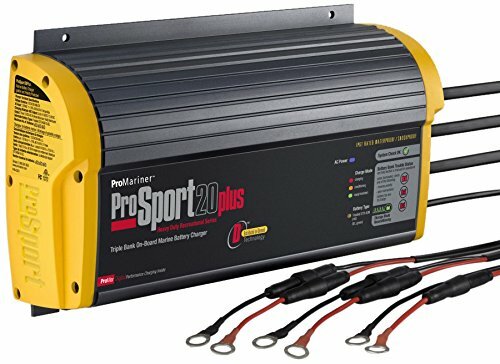 This on-board charger offers 24 volt system service. Only a three year warranty. Longing for a near real-bed experience on a luxurious airbed? Then end your search right here. Only a two year warranty. We are a group of professional reviewers who live to make your life better. This review on the best marine battery charger would certainly make your life even better! 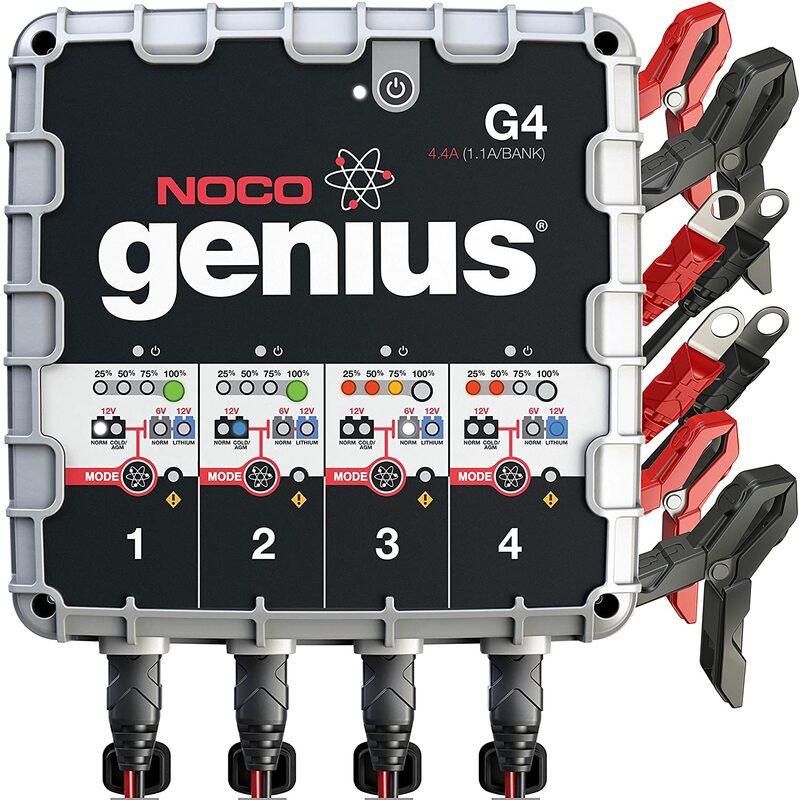 The NOCO Genius G4 ranks as our best marine battery charger overall due to its advanced features. This battery charger can charge four batteries simultaneously with four charging banks. It has the power to charge 12 volt batteries at 40 amps an hour. The G4 also works like a mechanic’s assistant by helping you diagnose a multitude of battery complications just by hooking the leads up. Technologically speaking, this is the most futuristic charger we could find and we love the capabilities to charge pretty much any battery you can get your hands on. It can even work on micro-hybrid start-stop smart cars and CANBUS electrical systems. You could waste your time charging a battery that is no good. But why? The G4 can tell you right away if the battery is no good. This battery charger helps you out with diagnostics by testing your problem battery for several red flags. The G4 also monitors your battery voltage while charging and adjusts the current to get a perfect charge whether you are working on six volt or 12 volt batteries. It also has an auto shut off so you can leave it hooked up well past the time charging is complete. This charger can work on all types of lead-acid batteries. We like the low temperature battery charge feature. The G4 has an internal thermometer and can switch to a more optimum battery charge mode when in cold weather. For really old dead batteries, this charger features a repair mode. The charger senses sulfation in old weak batteries and uses a low voltage pulse method to attempt to desulfate and restore the battery. The NOCO can fully charge a standard marine battery very quickly. It works about twice as fast as you can expect from other battery chargers on the same battery. The G4 is very compact. It measures less than 10 inches by 10 inches and weighs only 2.7 pounds. It can stand up to the occasional car driving over it and is waterproof. The design addresses the problem of getting to hard to reach batteries with five foot long leads. The charger also adapts to NOCO’s XConnect cable system to allow a variety of lengths of high quality cable. The people at NOCO are so sure of the sturdiness of this charger they backed it up with a five year warranty. The NOCO G4 more than meets the requirements of a marine battery charger. This little powerhouse charges all lead-acid batteries as well as newer lithium ion batteries. It has an advanced diagnostic system and is very easy to use. The G4 is our number one marine battery charger because of all the advanced features. It also has a vast number of uses aside from marine batteries, which should make it all the better to have around the house. If you feel that the best pick isn't meant for you,do check out the alternatives that'll still serve your needs. These are also our top picks and are highly recommended. The SSC-1000A works on most lead-acid batteries and offers automatic testing and charging. It also can recognize and repair older weak batteries with a desulfite mode. It offers multi-stage charging as well as maintaining batteries. This battery charger tests your battery for multiple diagnoses before charging. The digital display will alert you to any problems with your battery. The charger also has a digital voltage tester, and it has a display to alert you to any problems as well as what mode it is in. The SSC -1000A has three amp settings for 12 volt batteries. You can select the 10 amp fast charging setting for automobile and marine batteries. The computer controlled charger monitors the battery and adjusts the charge for quick and easy recharges. The six amp setting is perfect for everyday charges of your deep cycle trolling motor. It is also automatically adjusted and offers a safe, effective charge. For smaller batteries, there is a two amp charge setting. 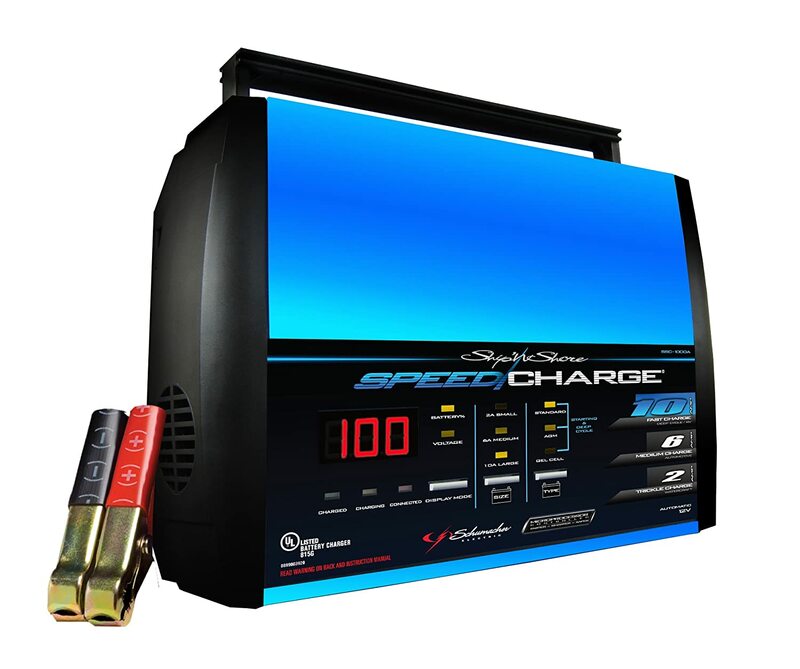 The SSC-1000A is able to be set to charge 12 volt deep cycle, AGM, Gel Cell and automotive batteries. This offers a solution to a variety of battery charging needs. This charger works as a tester first. Once you connect it to a battery, it will test to make sure the battery can take a charge and then begin charging. At this point, the charger will test to see if the battery needs sulfated. If it goes into recover mode due to sulfation, you may have to wait eight hours for it to complete the recovery. Once that is over, your charger will continue to charge normally to the voltage that was manually selected. Once the battery has reached peak charge, the charger automatically switches to maintain mode. The SSC – 1000A features a five year warranty, which is top shelf for a battery charger. It is also quite compact, measuring 3.3 x 10.8 x 7.5 inches and weighing only three pounds. The SSC – 1000A from Schumacher offers a range of features that will take the guesswork out of charging your deep cycle or marine battery. It also has automatic charging and maintaining capabilities. The SSC -1000A also features a digitally displayed voltage tester. This charger will work with most lead acid batteries and we recommend it as a good buy. 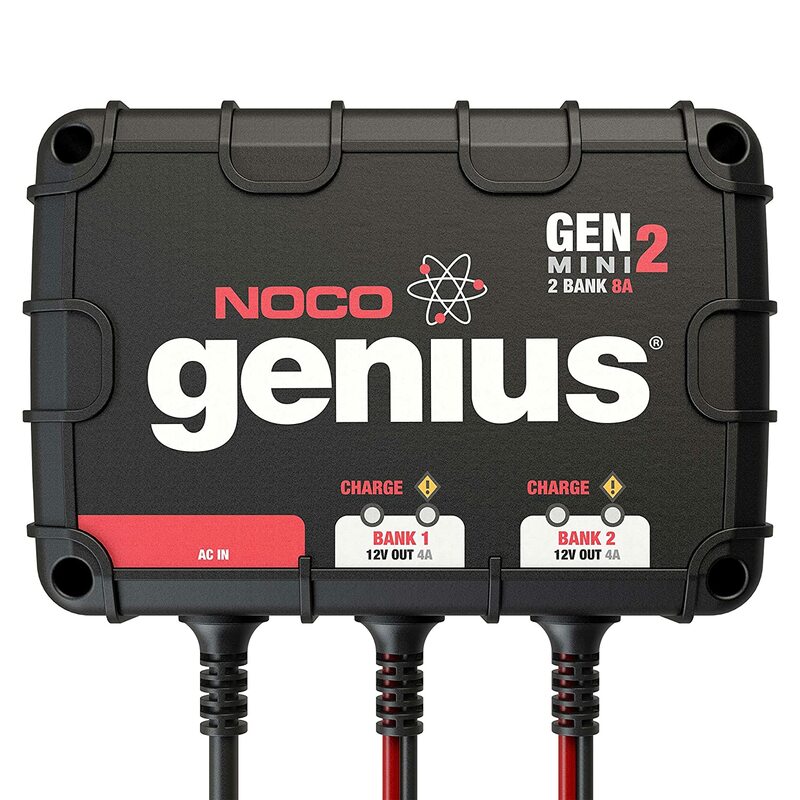 The NOCO Genius GENM2 is a professional grade on board marine battery charger. It is a worry free charger due to all the safety features, and is a great addition to any marine battery system. If you are running auxiliary components on your boat like a fish finder, you may very well find yourself in the market for an on-board battery charger. The NOCO Genius GENM2 is a solid charger made by the experts at NOCO. It features automatic charging and two bank convenience. Its safety features also make it a perfect on board charger. This battery charger works twice as fast as the standard charger. It also has multiple automated charging features including sulfated battery recovery, battery monitoring to enhance charging process and battery chemistry optimization. Once installed, you can simply plug this charger in and set it to do all the thinking for you. The two banks can be hooked up to completely different batteries even if they are wet, gel, MF or AGM. Because this battery is designed to be so self-reliant, the people at NOCO have instituted multiple safety features. The processor is designed to protect against things like reverse polarity, and open- and short-circuits. The charger also protects against overheating and overcharging. This charger is waterproof and, just like the G4, it has a ip68 durability rating. This charger can stand up to a lot of punishment and abuse, yet it is compact and easy to install. An on-board charger offers great convenience for your marine batteries, and the easy installation of the GENM2 makes it easy for anyone to use. It doesn’t take up much space and packs great charging power. You can also purchase the GCP1 as the recommended AC port plug. It makes the installation look professional and offers great access to the charger. The battery charger is rated at eight amps - four amps per bank. It works on a variety of lead-acid batteries. It comes with a five year limited warranty. The leads on this charger are six foot in length. This on board battery charger has a lot of high tech automation that we like. It is very safety oriented, and offers a great warranty. If you are looking for a built-in solution to your marine battery charging needs, look no further. The technology and versatility make this one of the best on-board battery chargers available. The MinnKota MK 210D is a great choice for an on-board addition to your battery charging system. It offers full automation and 24 volt functionality. The MK210D on-board charger has great automation and safety features. It has two banks with five amps per bank, and works on 12 volt and 24 volt systems. The range of uses is high, with MinnKota servicing flooded/wet cell, maintenance free and AGM lead-acid batteries. The MK210D has an internal thermometer that activates temperature related charging modes. This feature offers great protection for your batteries in the cold morning hours. You don’t have to worry about doing damage to your batteries when charging in hot or cold conditions. The on-board battery charger offers automated multi-stage charging to ensure you get a full charge every time. It works very efficiently to bring your battery back to peak condition. 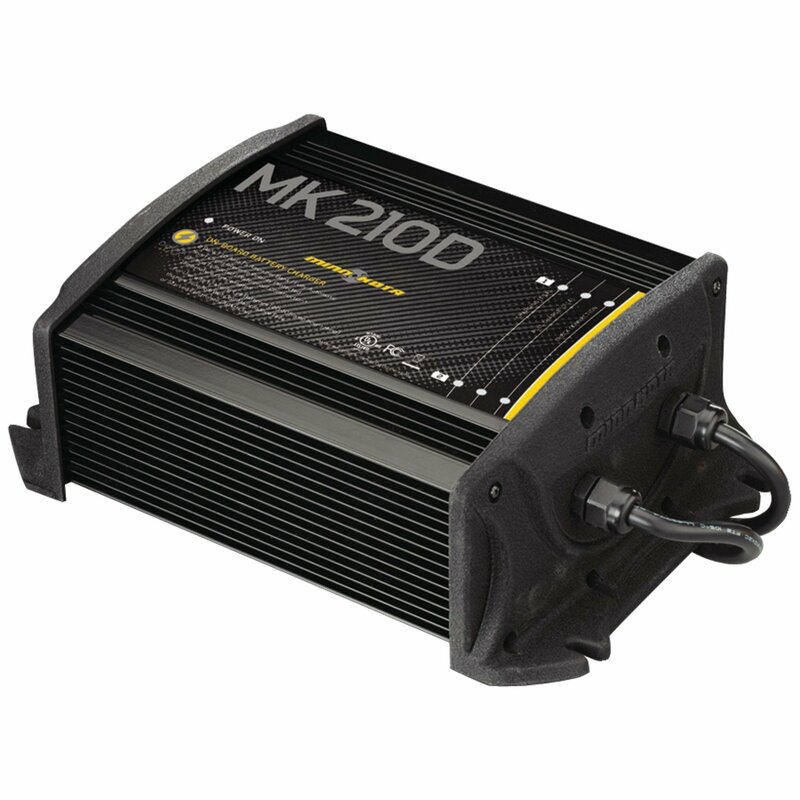 The MK210D offers a status code alert system that keeps you aware of the charge mode and maintenance stage. It also has an improved system for reporting error status. It comes equipped with fully automated safety features that protect against problems with reverse polarity and short circuits. It also has an ignition prevention system. The recovery time of this charger is 10 to 12 hours. It also offers two power banks with five amp output on each. The MK210D is relatively large at 11.5 x 7.5 x 4 inches. It is salt water friendly with an aluminium casing, and is also waterproof and shock resistant. It comes with a three year warranty and six foot AC and DC leads. The MK210D by MinnKota has great versatility with temperature control charging and 24 volt capabilities. The two bank system offers five amp charging in each bank and it is durable and reliable with a three year warranty. We like the features of this on-board charger, and the unique abilities may be just what you are looking for in your marine applications. We thought it was worth a look, and the safety features and automation make it stand out from the rest. The ProMariner ProSport Generation 3 offers extended battery maintenance features and three bank availability. This on-board option has power to spare and can keep your batteries in great shape for months at a time. The Generation 3 on-board battery charger offers extended battery maintenance features and has microprocessor automation to keep your batteries going strong. It has 20 amp charging power that is distributed throughout the three banks, which makes it very tough to beat. It is a very powerful charger with unique features that allow you to maintain your marine batteries even when the boat is in storage. The Generation 3 can maintain your batteries in long term storage with automatic maintenance features. You can plug in the system and it will maintain your batteries continuously kicking on and off as your battery charge fades. It also reconditions your batteries every month to ensure top performance when you take the boat out of storage. The Generation 3 distributes the 20 amps of power to its three banks. It charges all batteries that are connected in combination, altering the 20 amp power to most efficiently charge the batteries. The innovative amperage distribution allows it to utilize maximum charging capacity on the on-board batteries. The Generation 3 monitors the batteries for safety while charging. This offers extra assurance that you can plug it in and leave it on while your boat is in storage. It will alert you to reverse polarity, high temperature and overload and also features auto shutoff capabilities. It also has anti-ignition precautions built in. This battery charger comes with a two year warranty. For your convenience it comes pre-wired to allow for easy installation. It measures 12.1 x 7.25 x 2.75 inches. The Generation 3 will offer great potential to the boating enthusiast due to its monthly maintenance feature. It also offers great daily battery maintenance power and three bank convenience. The 20 amp charge rating makes it a very powerful charger for your on board charging needs. There are a lot of options when it comes to today’s marine battery chargers. From automation and safety to durability and power, there is a lot of potential for marine battery chargers of 2016. The on-board battery chargers we reviewed offer full automation and great charging capabilities for a dedicated on-board charging system. If you are looking for a permanent solution to your boat’s battery charging problems, we have picked the best two, three and four bank chargers for you to choose from. The portable battery chargers we reviewed have great versatility not only as a marine charger, but also for day to day tasks around the garage. The diagnosis systems and voltage meter take a lot of the guesswork out of maintaining your batteries. In all, the smart chargers of 2016 offer easy to use solutions to any of your marine battery charging problems. The marine battery charger products we reviewed for 2016 offer many different features for many different uses. While there is sure to be a battery charger that is right for you, it is best to know all the available features to make sure you get everything available you are looking for. If you are looking to charge a deep cycle battery for your trolling motor, you will probably look for the standard portable charger you can plug in and use on multiple batteries. On the other hand, if you are interested in maintaining batteries for long periods of time you will want a charger that you can plug in and leave for months. Believe it or not, if you want to keep a charger on your battery while your boat is in storage for the winter months there is one for that too. Choosing the right battery charger depends on which options you are looking for as well. Look for the charger that has the best combination of all available options. There are many different types of Lead/Acid batteries on the market; Maintenance Free, Wet Cell, AGM and Gell Cell. Most of the different types are serviced by all the chargers we reviewed. It is important to make sure you check your potential charger to see if it can accommodate the batteries you use. While there is one charger we reviewed that could charge Lithium Ion Batteries, you may not necessarily need to buy that particular charger. This is true especially because Lithium Ion batteries are simply not that prevalent on today’s marine battery market. They most likely will be one day, but if you don’t have one now you probably don’t need to get the Lithium Ion battery charger on the off chance you will get one. The battery chargers we reviewed ranged in the voltages they could operate under from as low as six volt batteries to as high as three 12 volt batteries wired to produce a 36 volt system. You may want to look around your garage and see what you have that may need charged. A lawnmower or motorcycle could be charged with your marine battery charger if it has six volt capabilities. Your car could be charged with a 12 volt charger. If your boat is 24 volt or even 36 volt, you probably will know already. There are on-board chargers that can be used for these systems if you need them. If you just need to charge your six volt or 12 volt battery before you take the boat out on the lake, you probably want the versatility of a portable battery charger. The nice thing about a portable battery charger is that it will allow you to use it for any appropriate battery you have. However, if your marine electrical system needs a dedicated charger you will most likely need an on-board model. The on-board battery charger is installed directly into your battery compartment and you just run the power cord from the charger to a wall outlet to charge everything on your boat. As a dedicated battery charger, you can install an on-board charger to fit any electrical system to eliminate the need to charge every battery on the boat separately. If you choose an on-board battery charger, you will have to decide how many batteries you want to be able to charge through your charger. The number of banks you need for all your battery operated equipment should be considered when you configure your battery system. If your boat has a fish finder or other auxiliary equipment, or if you think you may want to add equipment in the near future, you will probably want extra banks for your on board battery charger. The best battery chargers for 2016 are all smart chargers. This means they have microprocessors that optimize charging. They all monitor your battery’s voltage and switch between charging modes to top off your battery. There are many features available on today’s smart chargers. Some include extensive safety precautions including auto shut-off to avoid over charging, while others monitor reverse polarity and short circuiting as well. If you have concerns about specific safety precautions, chances are there is a smart charger we reviewed that addresses your concern. The smart chargers are not only completely automated. Some have beneficial diagnostic features that take some of the guesswork out of charging batteries. Some of the diagnostics include sulfation testing, voltage meters and battery detection. In all, there are a lot of advanced features on these battery chargers and we hope we have found one in the following reviews that fit your needs. Deciding which charger you need also has to do with how long you are able to charge your batteries before each use. Some chargers have special speed charging modes that crank up your batteries’ voltage at a very fast rate. Some chargers can completely charge a dead marine battery in just a few hours. You pay a premium for this feature, so if you don’t need to have your battery ready so quickly you can opt for a cheaper charger. If you don’t need a speed charge option, the next thing to look at is the amps your charger can dedicate to your battery. A five amp charger is going to charge your battery faster than a two amp charger. If you are interested in charging at a reasonable speed four or five amps should be sufficient for a full overnight charge. Keeping these things in mind, and adding and removing features based on your budget is key when buying a battery charger. Make sure you don’t overspend on features you can do without.